As I mentioned earlier, it's finals week from now until next Wednesday. So I'm purty swamped. Posting will be minimal. But the good news is that after the 20th I'm free!!!!!! I can read as much as I want! And I will! I'm like a dam ready to burst! But until then, check out this cover! This was the largest picture I could find. What do you think? Prized is the sequel to Birthmarked (Goodreads | Amazon ), which was one of my favorite books of 2010. I LOVE the cover to this one, but I don't really feel like it matches the cover of the first book. You're right, it doesn't really go with the first one's cover very well. But I have to say, this cover is GORGEOUS! I love it! Its Final's week for me as well but instead of the finishing on the 20th I'm done by the 15th. :D I can't wait either! All the books waiting to be read on my shelf! I can't wait! Oooh! Great Reveal the cover is very conceptual and awesome. :D Thanks for posting! Good Luck on your Finals! I agree, it's gorgeous, but not a set does it make. I think I prefer this "style" though. Heard anything about changing the paperback of Birthmarked to match? Hm. I haven't, but I hope they do! I was never a huge fan of the cover of BIRTHMARKED. Oh! I really like this cover! I wasn't the biggest fan of Birthmarked's cover... this makes up for it! Can't wait to read it! yay! 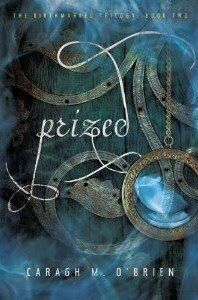 I loved Birthmarked, too, and am so excited for Prized. I liked Birthmarkeds cover. I like this one, too. But very different.